I don't even know how I can express my love for this show! It was so amazing! As I told my husband, I feel like it is a cross between The Goonies and the X-Files. Maybe someone else can make a better comparison, but that is what it reminded me of. 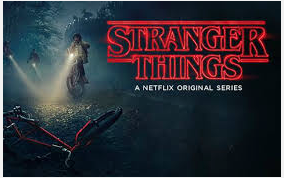 This show is good, it is fun, and has a fantastic 80s feel. If you are a child of the 80s, or just a fan of the 80s or 80s TV, this show is a perfect fit! I would say the show is suitable for kids ages 13 and up (it is rated TV-14, and I think that is a fairly accurate rating). It does have some fairly scary parts (creepy monsters, mostly) that younger kids may be sensitive to. There is also some death (again, creepy monster and evil government), so this show is not suitable for someone sensitive to violence or death. The show is only available on Netflix. Be prepared to bing watch the entire season at once!